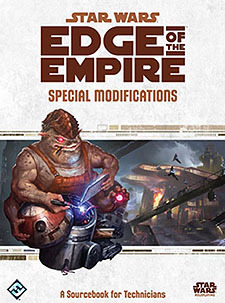 Open the ultimate Technician's toolkit with Special Modifications This rulebook expands on the Edge of the Empire Roleplaying Game adding new content for Technician characters as well as any character looking to build, modify, and repair custom gear and equipment. Invent unique new items, delve into computers by slicing, and perform crucial repairs in the nick of time. Expanded character options including Motivations, Obligations, species and specialisations. New signature abilities that allow Technicians to optimise their work and build complex devices on the fly. Rules and guidance for crafting new weapons and equipment, running slicing encounters, building Technician workshops, and more!